We all dread them; the appearance of split ends! A sign your hair is unkempt, perhaps overdue a cut or damaged by curling irons and other heat treatments. The science buffs tell us that split ends occur when the protective outer layer of the hair cuticle wears away because of external stress factors, such as heat styling and salon chemical services. Once the internal structure of the hair is exposed, it becomes weakened, dehydrated and damaged, causing split ends. How do you repair existing split ends? If you are prone to split ends, we recommend Caviar RepairX Split Ends Mend. Applied to damp or dry hair, this reparative product mends and seals damaged ends while strengthening strands to prevent future breakage. It absorbs instantly to control frizz, leaving hair soft and smooth. The formula is dual phase and contained in two separate chambers in the same bottle. When the product is pumped out of the component and emulsified, the two formulas – one of which seals the hair cuticle to prevent future damage and one of which smoothes the hair – are activated. Infused with Strand-Building Proteins that fill in gaps and tears in the hair’s cuticle layer, it restructures and strengthens strands and prevents future breakage. Like all Alterna hair care products, the Caviar RepairX Split Ends Mend is free from parabens, phthalates, synthetic dye, GMOs and triclosan. 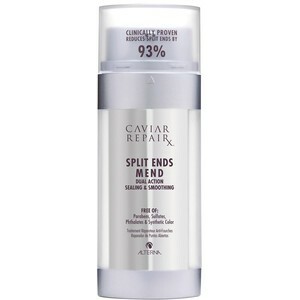 You can purchase Caviar RepairX Split Ends Mend via our online shop. Can you prevent split ends in the first place? Using a wide tooth comb after conditioning hair will help avoid snagging and breaking individual hair strands. Ensuring regular trims, every 6-8 weeks, will help reduce and eliminate split ends. This is recommended for everyone, even if you’re growing your hair. After all, hair won’t grow if the ends are split. For expert help with split ends please contact the Taylor Hughes Hairdressing salon. If you’re worried about split ends, why not visit us for a fabulous cut and blow with one of our friendly team? We’ll help restore your hair to a shiny, smooth state, free from those pesky split ends, and you can even pick up a bottle of Caviar RepairX Split Ends Mend whilst you’re here! Call us on 01484 353 498 or email info@taylorhugheshair.co.uk or enquiries@haircarebyyorkshiresfinest.co.uk.